Good timing, because I was thinking the other day I should see Bob Dylan while he's still alive and kicking and then I read reviews of his show and nobody could tell what song he was playing. So I no longer want to see Dylan live, but I'm hoping Pete Seeger comes to town one last time. I put Neil Young in that exclusive category that is for artists who are great songwriters but should not be allowed near a microphone. Dylan is the king of this category with the annoying Bruce Springsteen as his right side. Here's a tip to these guys: Just because they're YOUR songs, doesn't mean you have to sing them. Obviously it's subjective, but I love Neil's voice. It's raw and real and I'd rather hear him sing his songs than anyone else. But like I said, it's so subjective. Some people can't stand the sound of Geddy Lee's voice while some people love it. The different voices are alienating. 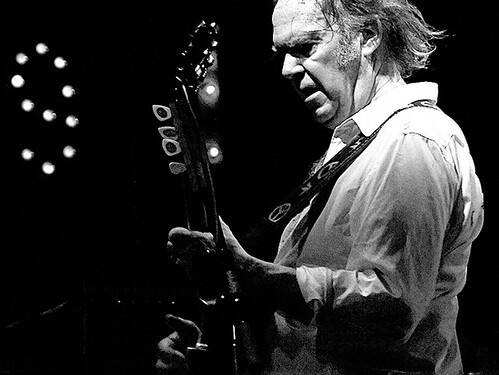 Neil Young - long may you rock. I wish I could see him perform live someday too. And I've been reading a lot about this tour and I don't expect to hear any Neil Young classics. This isn't about me hearing him sing Helpless or Down By The River. This is about seeing him while I can. So if he wants to do a 20 minute jam in the middle of something new off of Psychedelic Pill, I'll be ready. This is a Crazy Horse tour. I haven't imposed such a rule onto myself, but if I could see any band alive or dead, it would probably be The Doors. Maybe in these comments we should limit the acts to the living. The Doors with Morrison has as much a chance of happening as Nirvana. I've never seen Soundgarden. I'd like to see them. As far as artists where it is still possible, my first choice would be Bowie. Unfortunatly most reports seem to indicate he is pretty much retired. Otherwise, Neil Young is next on my list. With Geddy, I like it and my brother's don't. The problem with todays music (I'm about to sound like a crusty old man here), is it so over-produced. Artists like Neil, Bob Dylan, and Bruce, and Geddy would never make it, because their voices are too raw, too unique. Could you imagine someone like Neil walking into American Idol or Xfactor? He'd never make it 5 seconds before he'd get thrown out, and then mocked behind his back. Sadly, we live in a music era where most 'pop' music is so modified (hello auto-tune) that everyone is starting to sound the same. The Sadies: 7:30 p.m. - 7:50 p.m.
Los Lobos: 8:05 p.m. - 8:40 p.m.
Neil Young and Crazy Horse: 9:00 p.m. - 11:00 p.m.
After we recorded that podcast, that was the topic I kept thinking about and later all these acts came into my head that I wished I could have seen live. The Doors was number one. Also would have loved to have seen Janis Joplin perform, INXS with Michael Hutchence, Amy Winehouse and Michael Jackson way back in the day. My brother was at that Dylan performance and was pretty disappointed, especially since he was with me at his concert at the Amphitheatre about ten years ago that was really remarkable. Must have just got lucky that time as from what I read, most of his concerts are unintelligible. *Gowan played Strange Animal twice. TWICE! I have never, ever been to a show where the artist played the same song twice. It's TOO BAD he's not playing his classics. Reading reviews with Crazy Horse - Time to shut it down even though he is a enigma for Canada & the best that ever WAS. What city is the Neil Young shrine and store located? Nothing beats getting let out by my parents in front of Massey Hall, drinking a huge amount of Wink and seeing Devo in '82 at the peak of their "Working in a Coalmine" era! Haha - I forgot all about Wink! If I had a time machine, I would want to see Jimi Hendrix live. Today, I would either want to see Mumford and Sons or Greenday. I have heard that both groups put on pretty great shows. Wow... I arrived at the concert with socks on, I'm sure. But they were totally blown off. Almost 2.5 hours of Neil rockin' out like a man 1/3 his age. I'll say more on episode 16 of Toronto Mike'd, but needless to say it was an amazing time and the man is a legend. Wow. Also want to see the Stones, but, not sure they would be affordable.